In his truck on the way back from his fishing trip, Arunas was feeling pretty good. He was warming up (outside it was barely above freezing), and he’d had a great session out on the lake. The highlight was landing a really nice pike. But in fact his trip wasn’t over, and back in the warm comfort of his home he was about to make a discovery that would change the way he fished that water forever. All he needed was his computer, a smart tool for viewing his lake maps and scans, and some good old fisherman’s know-how. With his Deeper depth finder set up, Arunas started trolling across the lake – a fairly new spot for him which he was still exploring. With his sonar in Boat Mode he was getting scans showing depth, vegetation, bait fish and fish arches. But he was also creating an underwater contour map using his phone’s GPS as he trolled. And the map he created would prove crucial in helping him make an amazing discovery. So, Arunas and his fishing buddy started making some casts. A few minutes later and he’d hooked up a really nice pike (73cm / 28” and 3.5kg / 8lbs). He tried a few other spots, caught another couple of small pike, then headed home feeling great. A lucky hit or a new fishing hotspot? So, with a warm cup of coffee in hand, Arunas sat down at his home computer and logged in to Lakebook, Deeper’s web portal for viewing, analysing and sharing your maps on any computer. And it was a new addition to Lakebook’s functions that helped Arunas understand exactly how he caught that pike at that spot. Thanks to a new update that syncs all your data, now you can view both your maps and your sonar scans on Lakebook, with every spot marked with precise GPS data. 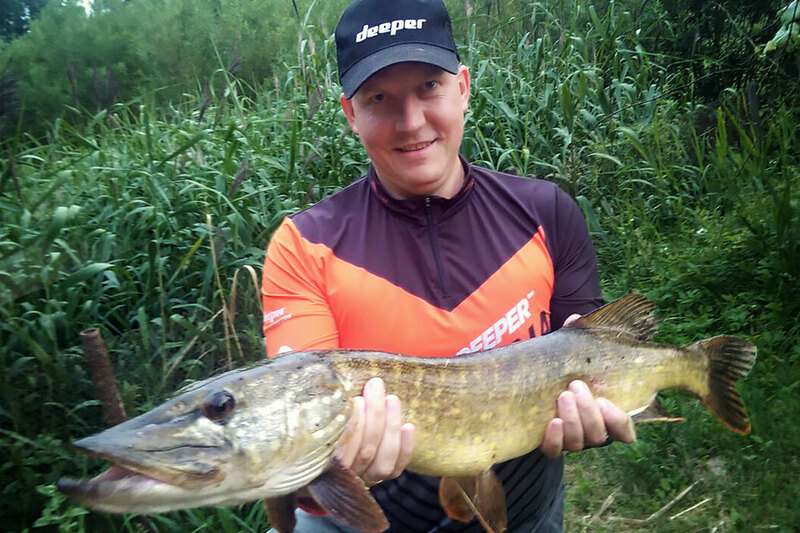 Arunas started scrolling through his scans to find the spot where he caught his beautiful pike. And he made 2 surprising discoveries. But his second discovery was much more important. Before he used Deeper and Lakebook, Arunas would return to the same spot where he had caught on a previous visit, but often he would be unsuccessful second time round. Sometimes you just happen to be in the right place, at the right time. But that doesn’t mean you’ve found a hotspot for your target species. And in the heat of the action, you don’t get the chance to analyse a spot in detail. Have you missed a fishing hotspot? Ever caught at a location one time but blanked the next, and couldn’t figure out why? Why not find out more about Lake mapping with Deeper, including a huge update to the Deeper App which makes data syncing easier and more secure than ever. Then you can go from guessing, to knowing.